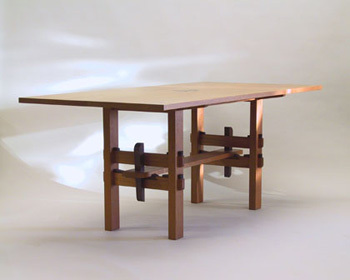 The customer visited my web site and was drawn to the Ricker table, which was originally inspired by a Charles Prowell design. After exploring a few design options, we came back to the Ricker table as our starting point. While the lines and details are very similar, we created a table unique to their ideas by emphasizing the table top with ebony inlay on the corners and a carving of the Chinese characters for harmony in the center. Rather than do an inlay like the treatment on the corners, I carved the outline of the characters then dyed the figures black. I did this to give more of a lyrical flow to the line, similar to the original calligraphy. The top is made from two exceptional Honduran mahogany planks, giving the table a long, even, subtle figure, which is what makes this particular species so beautiful. The design and construction details of the base are mortise and tenon joinery, giving reference to both the Arts & Crafts Movement as well as Japanese aesthetics.